Debbie E! Congrats Debbie, and thanks for entering. Your awesome Ice Road Trucker package will be on its way to your mailbox shortly. Enjoy, and thanks again for checking us out at TV Screener.com! Season three is in full swing (with the first female driver in the show’s history!) on the History Channel (Sundays, 9PM ET) and on iTunes and there’s a cool new Ice Road Truckers app for the iPhone and iPod Touch that’s been downloaded more than 350,000 times … so what could make an Ice Road Truckers fan’s day even brighter? 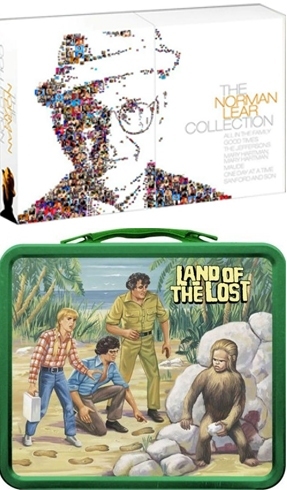 The chance to win a fabulous prize pack from our friends at the History Channel! 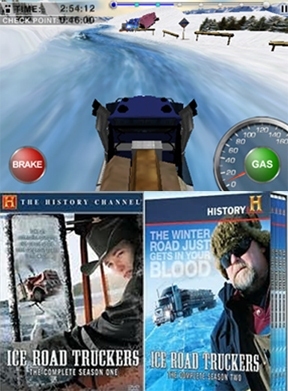 The generous collection includes one copy of American Originals (which features the show’s first season and the Ice Road Truckers: On and Off the Ice DVD), one copy of Ice Road Truckers season two and one copy of the Ice Road Truckers: Most Dangerous Episodes DVD … everything you need to get up to speed on all things IRT! So, how do you get your hands on this nifty collection of Ice Road Truckers discs? Just leave a comment on this post, with the name of your favorite Ice Road Truckers driver and an e-mail address or Web/blog link way to reach you, and you may be a winner. Good luck, Ice Road fans, and keep on truckin’! Filed in Reality, TV on DVD, WIN THIS! Tabitha S and Debbie E! Congrats ABC Family fans, and thanks for entering. Your awesome box sets will be on their way to your mailbox shortly. Enjoy, and thanks again for checking us out at TV Screener.com! ABC Family’s hit drama The Secret Life of the American Teenager is heading into its third episode of the show’s second season – and there’s already been a tragic death! – but volume two of the show’s premiere season recently hit DVD, and thanks to our generous friends at Walt Disney Home Entertainment, TV Screener.com has five copies of the fantastic family drama to give away. Volume two overview: The set includes episodes 12-23 of the show’s Gracie Award-winning first season. That covers pregnant teen Amy Juergens’ (Shailene Woodley) idea to marry boyfriend Ben (not her baby’s daddy, Ricky) after she decided to keep her child; the separation of Amy’s parents George and Anne (Molly Ringwald) and George’s subsequent move into the family’s garage; the return of Ricky’s evil father; Amy’s decision to give up her baby for adoption; Amy’s change of heart; a flashback to the band camp night that led to Amy’s pregnancy; and the birth of baby John. So, how do you get your hands on one of the five Secret Life of the American Teenager box sets we have to give away? Just leave a comment on this post, with the name of your favorite Secret Life character and an e-mail address or Web/blog link way to reach you, and you may be a winner. Good luck, Secret Life fans! Good news, Sons of Anarchy fans: No, the show’s not coming back sooner than September, but the first season DVD release has been announced – August 18 – and the box set will be loaded with commentary and other bonus features. The show, which is a lot like The Sopranos, if Tony and company were Hell’s Angels instead of mobsters, was one of the best new dramas to hit the tube last year, with the whole main cast being Emmy-worthy: Charlie Hunnam, Katey Sagal, Ron Perlman, Maggie Siff and the scene-stealing Kim Coates. And season two promises to be just as great, with punk rock star Henry Rollins joining the cast as a new resident of Charming, one who “poses a deadly threat” to the SAMCO crew. Keep an eye on series creator Kurt Sutter‘s blog for more scoop on season two, including photos from the set. CENTURY CITY, Calif. – One of the most critically acclaimed new series of 2008, Sons Of Anarchy Season One gets its motor running on Blu-ray Disc (BD) and DVD August 18 from Twentieth Century Fox Home Entertainment. From the creative mind of Kurt Sutter (The Shield) the series chronicles an international outlaw motorcycle club that brandishes their own kind of law in the fictional Northern California town of Charming. Charlie Hunnam (Nicholas Nickleby) stars as Jax Teller, a man whose love for the brotherhood is tested by his growing apprehension for its lawlessness thanks to the birth of his newborn son and the discovery of a life-altering journal written by his father years ago. Under the watchful eye of his force-of-nature mother Gemma (Katey Sagal; Married With Children) and his stepfather/club president Clay (Ron Perlman; Hellboy), Jax is forced to keep his friends close and his enemies closer as he slowly begins to distance himself from those he considers family. With white supremacists, gunrunning hoodlums, meth-dealing rivals and crooked cops, Sons of Anarchy is exciting, risky and downright chaotic. 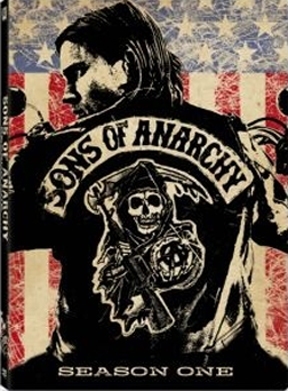 Sons of Anarchy Season One BD and DVD include all 13 original episodes from the first season and is packed with daring bonus features including behind-the-scenes making-of featurettes, cast and crew commentary on select episodes, deleted scenes and gag reel. The BD will be available for a suggested retail price of $59.99 and the DVD will be available for $49.98. Prebook is June 9. FX Network’s original series, Sons of Anarchy, is an adrenalized drama with darkly comedic undertones that explores a notorious outlaw motorcycle club’s (MC) desire to protect its livelihood while ensuring that their simple, sheltered town of Charming, California remains exactly that. Charming. The MC must confront threats from drug dealers, corporate developers and overzealous law officers. Behind the MC’s familial lifestyle and legally thriving automotive shop is a ruthless and illegally thriving arms business. The seduction of money, power, and blood.